Coaching is available from our club coach Anthony Harbrow. 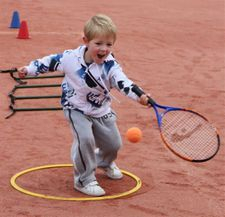 Tiny tots learn tennis from ages 3 to 6 years. 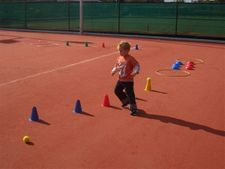 This gets kids introduced to the game and is designed to show the kids the necessary skills while having fun at the same time. Children who are 10 years old and over join our weekly MegaTennis classes. These classes are graded from Beginner to Advanced and cater for children wanting to learn new skills or develop ones that they have already learnt. While learning and developing their skill base is very important, we never lose track of the fact that the classes need to be enjoyable. We keep the classes small so the children don’t feel that they are lost in a big group with a wide age range and skill levels. If a child doesn’t have their own racquet we have a selection of quality Head racquets freely available for them to use that are tailored to their different age groups. More advance players join senior squads as they become able to rally. They enjoy advanced coaching plus real match play experience. 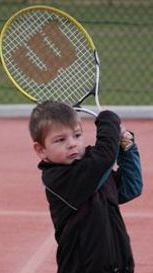 Many children in our older classes also play in regular competitions on other days or on weekends. Group and individual private lessons available.